Video update from the body shop. 1 minute long. Also spent the weekend getting organized on parts needed to move forward with what I want to do to the motor. Put in a large order this morning. As long as they do a good job on the agreed upon timetable they can mess around like that all they want! i say you can't trust people that don't give you a hard time. Epoxy primer went on the exterior today. Excited to see the progress! Body shop is very pleased with the condition of the body. How did I miss this thread. Car is going to be amazing when done. Nice work! PPG DP90LV epoxy primer and DP401LV low VOC epoxy hardener. Haven't had a ton to update as of late. Since getting the car off to the body shop I have spent quite a few hours catching up on some maintenance on my Cobra. 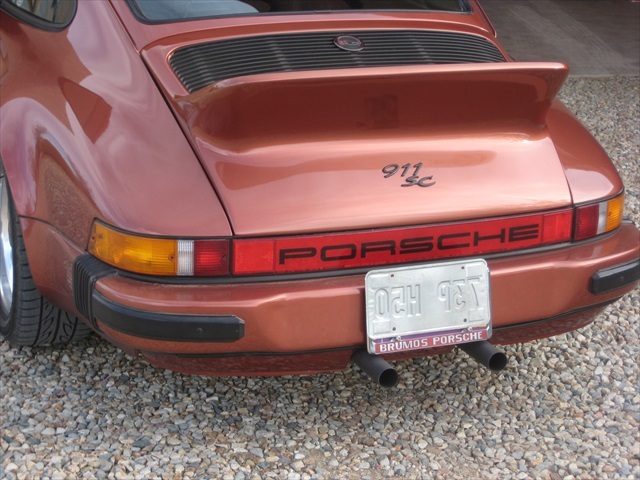 Have that all squared away for prime spring driving season and have been devoting some more time back to the 911 build. 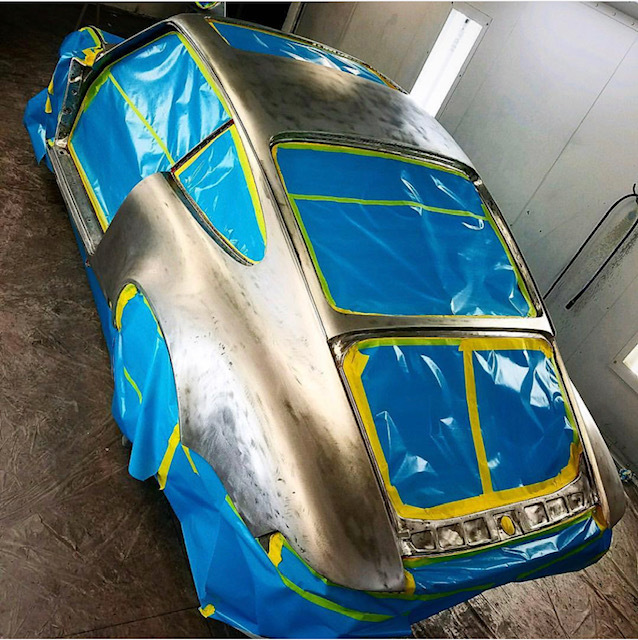 I find it a little hard to prioritize spending hours on the 911 right now as I still know I have months until the car comes back from the painter and I dont have months worth of work to do. Been doing a ton of research about what I want to do with the motor and spending a lot of money with our host ordering many parts. 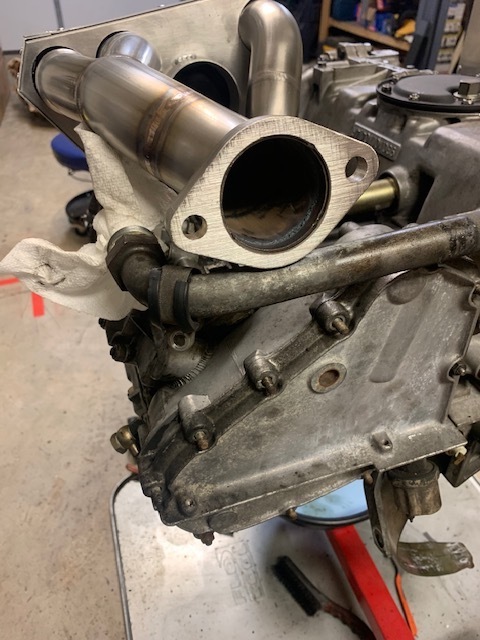 I have mentioned a few times that the motor was running quite well when I took it out and was on the fence about sending it out for a full rebuild. Ultimately I decided to just do some incremental upgrades and possibly in a few years pull it back out and go more extreme on the power. I had also previously mentioned trying to decide between a chain tensioner rebuild or doing the full upgrade. Upgrade to the carrera chain tensioners. My strategy here was to minimize replacing things twice if I go ahead with stage 2 I will call it on the motor. Other than seals and gaskets most of these items should be good to carry forward. Other than that I have started cleaning up the motor. Tons of oil residue from years of drips. Figure also if I start with a pretty clean slate that will help me to identify future leaks. I did refurb my oil sump plate yesterday. Old one looked pretty rough but I did not want to spring for a new one. New gaskets on the way and I also have new nuts but have the old ones on for now just to keep it secure and nothing from falling in there. Here is a before and after pic. My next task is to test fit the exhaust system and see if I will have any issues that need resolving. Then I will get back to cleaning and start with all my engine projects after that. Update from the body shop. Decided I liked the look of a painted dash done in the primary exterior color. They are prepping for that and did some epoxy primer on the inside. Been spending a lot of time cleaning old oil off the engine. I am only going to get it so clean. My main goal is to have it clean enough that I can tell if I have fresh leaks and hopefully where it is coming from. Have been ordering tons of parts from Pelican and am starting to install some of those now that the cleaning has been completed in certain areas. I went to test fit my M&K headers with the heater boxes because I thought I might have a conflict with the oil line. I sure did. Ended up ordering oil lines to backdate the system. 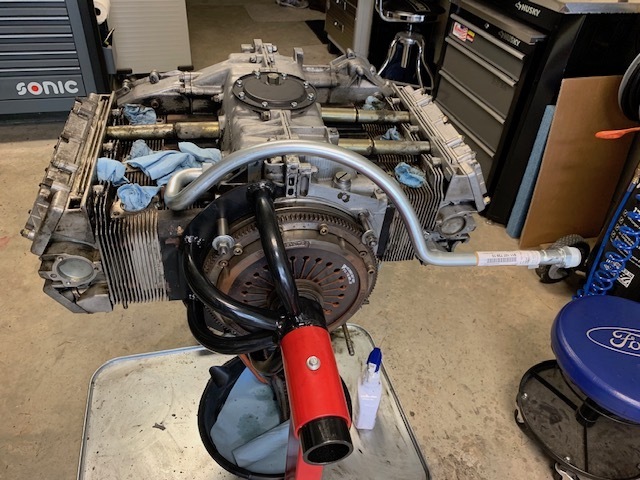 The hookup point on the motor is quite close to one of the oil return tubes and with the return tube in place in makes it a little tricky to get the big wrench on the nut to tighten. I had hoped to position the line as needed and lock in in position. Came up with 2 problems. 1. The way that line goes I am afraid when I put the motor on the platform to lift it into place it might get stressed or bent and 2. the position it needs to be at seems to interfere with the engine stand mount. I am just going to wait to install that until after the motor is in the car or partially in the car anyways. Same for the headers. The 2nd picture below shows how the old oil line was in conflict with the header. Started replacing the oil return tubes today on the side I finished cleaning up. Funny how it takes about 90 minutes of reading the forum for tips, watching you tube and figuring out how to pry those in and out for the first one. 2nd one took 10 minutes and I suppose the last two will be about 5 each. I enjoy the learning aspect of these builds and adding to my knowledge base. Work continues at the body shop. Locked in the final price of that. More than I was anticipating but what else is new! Feel good about the guys doing the work and what the final result will be. Here is a shot from the interior work for the custom colored dash. Still just black epoxy primer. Continuing to wait for my custom seats from GTS classics. Long story but through some fault of my own the custom colored shells did not arrive looking the right color so we are having to order a different color which is time consuming and delaying the process. Stefan has been great to work with. These are expensive seats and I am really pleased with his attitude to get them exactly how I want them. Great progress Scott. Haven't wanted to jinx you with a text regarding the Tournament.... Good Luck. 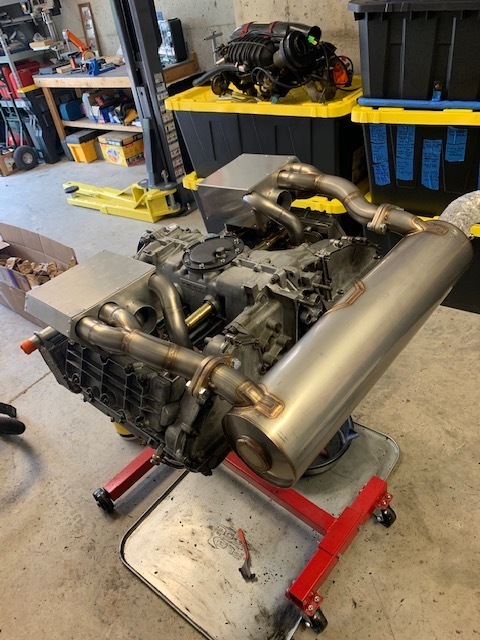 Installed my exhaust studs and mocked up the exhaust system today to check fit. Looks pretty cool! Cant wait to hear it. The nuts on the flanges look like a couple of them will be quite miserable to install. Already not looking forward to that! Ordered from Brian at M&K. Great looking system and Brian has been very helpful to work with. Continuing to plug away on drivetrain projects while the car is at the body shop. The majority of my labor seems to be cleaning up old parts and cleaning oil of the motor and transmission. I am not looking for as new look. Just want it clean enough where I will be able to tell if I have new leaks after I get it running again. I completed the oil fed chain tensioner upgrade. Also upgraded to the newer style idler arms while I was at it. That all went well without any problems. 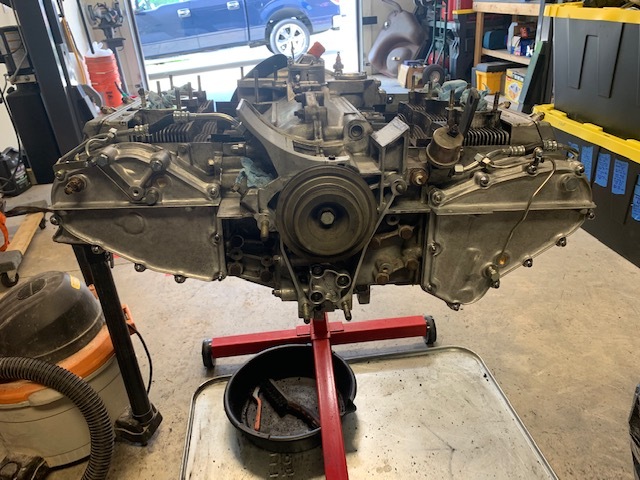 Was nervous about moving the timing chain but that really was not a problem at all. 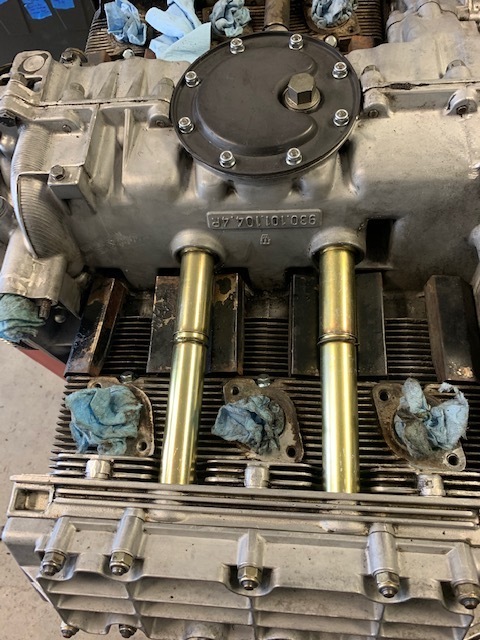 Here is a before and after picture of the insides and the new oil lines running into the covers to feed the tensioners. After that I changed the front pulley seal. There was quite a lot of oil residue around the old one. Not sure if from that seal itself or someplace else but at least I have a new seal in there now. The pulley covers where in pretty ugly shape so I blasted them and have them at the powder coater. Will pick those up next Monday and resume on engine projects. Today I cleaned up the transmission. Took it out side and power washed it. That worked quite well. Installed the new mounts and attached the support bar that I previously had powder coated back to the bottom of the transmission. Had to order a few small parts. Once I get and install those the transmission will be all ready to mate back up with the motor when I am ready. Do you have a plan for license plate lights? Yeah, I have these little bolt lights that secure the license surround to the frame...they work great. They are the bottom bolts...same thing for this application...I drill a hole on the bottom of the bumper (can't be seen) and thread the wires up behind the plate. I'll take some pics of them and send them.